Thanks to a recent reader to this blog who wanted to know how to right-align 'Read More' in Blogger which prompted me to google for answers and learned much in the process. 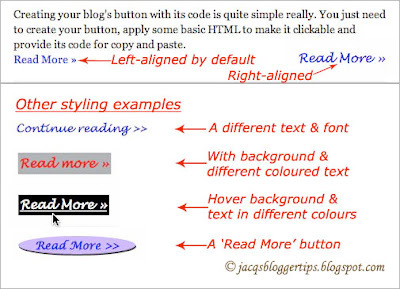 Hence, I'm happy to share here some related tips for those seeking to learn how to customize and style the 'Read More' or Jump link in various ways as illustrated in the image below! To do that, you'd first need to have the 'Read More' link below your post summaries in your blogspot posts. If you don't know how, follow this tutorial to create 'Read More' with Blogger's jump break feature. Sign into your Blogger account. At Dashboard, selecting Design will bring you to the Page Elements page. Click the Edit button of the Blog Posts gadget. 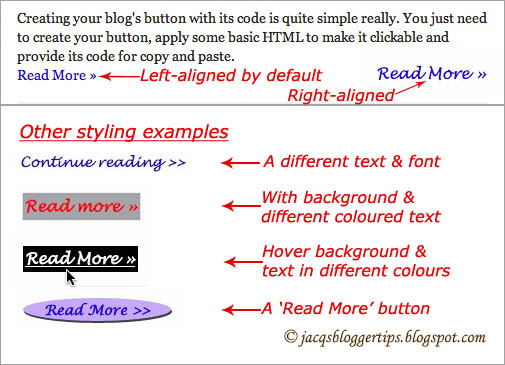 The pop-up Configure Blog Posts appears to enable you to change the text to whatever you fancy. Click Save to exit and effect changes. Just need to add CSS (cascading style sheets) to your blog's template. Go to Design | Template Designer. Note: The image below gives an example of the CSS snippets that were added to customize and style the 'Read More' or Jump link as explained in sections B to E above. Go to your blog's Dashboard | Design | Edit HTML. Before editing, download a copy of your template. When done, click Preview to see the changes and if satisfied, click Save Template and View Blog. If you'd like to right-align the button, simply follow steps at section B above. Enjoy styling the appearance of your 'Read More »' links! Thanks for the thumbs up, Manish! Thank you for all the hard work and keep up the good job. Cheers! That's sweet of you, A. Belle! Thanks a lot! Will hop over shortly. As always, very very informative. One request: Can you remove the word verification, it will allow commenting easily. Secondly, I have a question, a little out of context but may be you know a solution. When I follow blogs, my photo does not show up in the followers list. It however does in my profile as well as comments I give on other's post.I found some solutions to change it through the Blogs I am following> Manage>Setting, but when I click on the settings button corresponding to any of the blogs I follow it takes me to Google friend connect page and I am asked to log in again. When I do it using my google account, it gets me back to the same place and the loop never ends. Thanks for your kind comment, Avinash Chandra! Sorry, first request rejected as word verification is an additional tool that's necessary to reduce spammers. Re your question about photo not showing in followers list, I'm really clueless on this matter. Probably you may want to redirect it to Blogger Help @ http://www.google.com/support/blogger/ where others may be able to help solve your problem. First of all sorry, I was away traveling for some time and hence could not reply before. I understand your point of sticking to word verification. Regarding my problem, I have solved it. Thanks for the kind gesture. Thanks for responding, Avinash. No need to apologize as it's understandable that everyone has his/her own priorities and life to live. I'm glad that your problem is over. Hello! I am a new follower, and new blogger that has found your site to be so very helpful to me! I posted about your site today on my blog, which is normally about sewing lol.. http://sew-chic-designs.blogspot.com/2011/02/archives-page-and-blog-tips.html . Being a new blogger it is hard to understand how some of these little(and not so little) changes are made that make a huge difference in how your blog looks, and I can't thank you enough! Have a great day and I will be reading!! Welcome and thanks for following, Loree! I'm delighted that you've found my tutorials helpful and really appreciate you taking the trouble to pen your positive thoughts and linking to my site...thanks so much!! Nice article. This is a helpful post. Thanks for sharing your thoughts. Looking forward for more tutorials in Blogger. I couldn't move it to right side, if i didn't read this post. Outsource SEO: Thanks for feedback and appreciation. Sankar Datti: Great to know your wish fulfilled. Thanks for feedback. That's great, Mom Chef. You're most welcome and thanks for following. Thank you very much.. very useful to me..
Great to know it had been useful. Thanks for your feedback. Thanks for your kind comment, Ashiq! I enjoyed reading this informative post of yours. I was impressed and I like it. I am looking forward in your next post. Keep sharing. It's cool that you're able to style those "read more" links easily with CSS. But there's something about those that made me think about my site's bounce rate. Wouldn't clicking a "read more" link from the main page count as a bounce from your domain? Thanks, Man Ray! I don't think that clicking the 'read more' link is considered a bounce as the reader is directed to the post page which will be counted as a second page visited within my site. Your post was simply incredible and I really like it. I enjoyed reading it. You did a good job. Thank you for sharing. Thanks for the thumbs-up, Shasing. Much appreciated. Max, could you please reword your request because it's incomprehensible. Anyway, I noticed that you already have 'Read More' in your blog posts. Thank you so much!!! I messed around for hours trying to get this coded right. It only took me one try with your help. You're most welcome, Angela and thank you for the positive feed back. Very useful CSS utilization with the "read more". One way of improving your writing skills i think. Thanks a lot for this. Thanks for your positive thoughts. I LOVE THIS AND THANK YOU SO MUCH!! saved my blog. <3 <3 <3 keep up the good work! Happy to know you're delighted with the result, Fena! Thanks for your appreciation and encouragement. You're most welcome, Marsha... I love sharing my knowledge! About changing your background, if you're using the Blogger Templates, just choose 'Template' at your dashboard, then click 'Customize' that appears below 'Live on Blog' and scroll to 'Advanced' and follow through the various sub-menu on background to achieve your desires. Thanks for dropping by, Carlottas. I'm truly sorry that I'm unable to help you 'cos I don't troubleshoot technical problems. Whatever I've tried out successfully are in my article above. Probably you may want to redirect it to Blogger Help @ http://www.google.com/support/blogger/ where others may be able to help solve your problem. Thanks a whole lot. Used this knowledge to make changes to my blog. Keep up the great job. My pleasure in sharing, William! Great to know and thanks for the encouragement. LOVE IT! thank u sooo much.. the CSS function in advance option works just find! so much simple than html... thank u! You're very welcome, Sarah. To add your required space, edit your post just before the 'Jump break', press the 'RETURN' or 'ENTER' key on your keyboard a few times to effect the line breaks/space as desired. thank you so much! one question, when I added it, it also changed the font of the "linked within...you might also like..." that is right beneath it. How can I fix that please? Sorry, Lucy Designs... I'm unable to help you 'cos I don't troubleshoot technical problems. Whatever I've tried out successfully are in my article above. I don't understand why your font for the phrase 'You might also like:' changed since both the Read More link and You might.... are entirely different widgets. Thanks for sharing, very helpful indeed! I surely made my blog prettier. Usually I never comment but the results were so compelling I just wanted to give you a big THANK YOU. Really made my day. Thank you very, very much! Such clear instructions :-). You're most welcome, Heidi Kay. Have a nice day. Thank you! I know this is an older post, but I was needing to change the size of "Read more" and couldn't figure it out. Thank you so much! Great to know that it help you, Sydney Logan. This is another thing you've really helped me with! I just had to mention your blog in one of my blog posts, hope thats okay! Hi Katie. That's sweet of you... I really appreciate what you've done. God bless. Great to know, cassie cadiz. Much thanks for voicing your opinion. Happy blogging. This is the most amazing, most helpful post so thank you very much for sharing! I have tried all day adding HTML without luck and your method is simple and effective!